Children, teenagers, and adults alike will get the message that tooth decay and disease don't have to be inevitable with this eye-catching 3-D display. 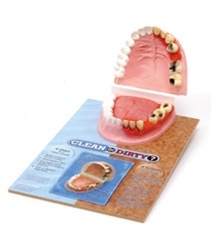 Shows the contrast between the "clean" side of the mouth with healthy teeth and gums and the "dirty" side with tartar, cavities, gingivitis, and periodontitis. Also lists steps to keeping teeth healthy. 10" x 8 1/2" x 15".